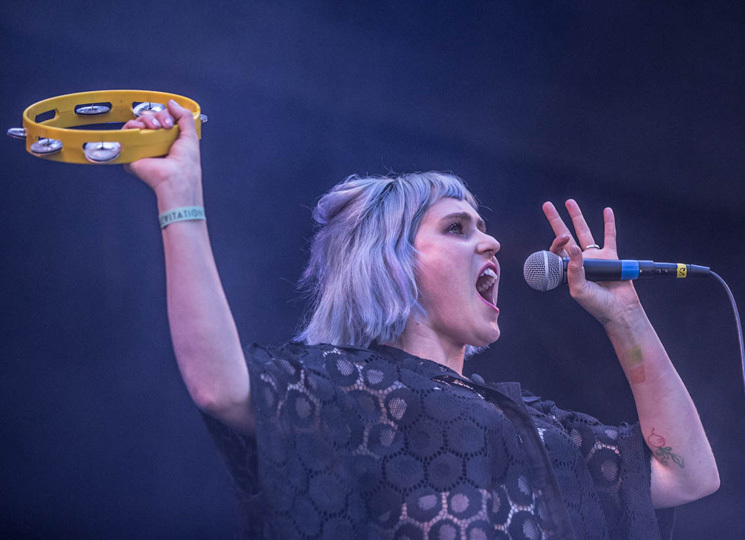 The rock gods weren't exactly kind to Seattle's TacocaT for this show. They survived a three-hour ordeal at the border, which cost them $200, only to play to a relative handful of people at two p.m. They'd never successfully crossed the border before, so they had that going for them, but they appeared to be shaken by the experience nonetheless. Early on, Lelah Maupin's drum fills and tempos were shaky and Emily Nokes vocals were a little rough around the edges, with a few of their songs stumbling to conclusion early on, but they tightened the screws by "Psychedelic Quinceañera," what they professed was their most psychedelic track, and their joyful presence warmed over any missteps. Between bassist Bree McKenna's cloud dress, guitarist Eric Randall's rainbow strap, Maupin's big pink bow, and Nokes's faded blue bob and frilly purple skirt, they dressed the part of cuddlecore queens, but they delivered a healthy dose of bubblegum cat fancy and riot grrrl feminism, their songs tackling everything from street harassment and vaporizers to anarchy and Tanya Harding. They may be cute as bug's ear, but this kitten's got claws.